Waiting on microfilm from Utah can be a timely, but rewarding, matter. Earlier I had many posts on the 'Scarlett O'Hara' of my family tree, Mariah Booth Winfield Moffett/Maffett Booth. I had found her in Lawrence County, Alabama, where she had filed suit in a Civil action against her second husband and first cousin, Dr. George Washington Boothe. Both Mariah's mother Mary "Polly" Booth and G. W.'s father Harper Booth, were children of Thomas Booth of Mecklenburg County, Virginia. The marriage was not a happy one. In the suit, Mariah had accused George of being a drunk, a gambler and a spend thrift, having his way with her slaves left to her by her father, Joel Winfield and grandfather, Lt. Joshua Winfield. She said his actions toward her, and her only daughter, Mary Ann Newland Moffett, were 'cruel' and 'indifferent'. Two years after the marriage, she had filed suit. The suit and legal actions in court took place between 1838 and 1840. 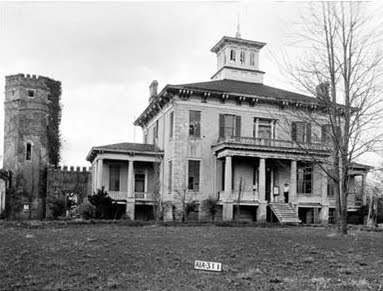 During this period, Mariah had turned guardianship of her affairs and property over to Robert Kernachan, her uncle by marriage, in neighboring Lauderdale County, Alabama. She had nearly every notable person in 3 or 4 counties to testify as to the misconduct of the good doctor, who promptly took off to Mississippi, after burying his mother Nancy Booth in Franklin County, Alabama, and settling in and around Itwamaba and Lee Counties in Ole Miss with his father, Harper and brothers John Fletcher and Thomas. His father seems to have owned property in 2 counties in Alabama and 4 in Mississippi. Just a few years after, in 1842, for unknown reasons, Mariah turned her affairs over to another relative, John Nicholas Malone, after having been defended in court by her couisn, Vinkler Jones. The papers had stated that a divorce was sought, but I had not been given a final date on the outcome. Then arrived the microfilm. It can not be copied, as the machines are not set up for that at the Mormon Church, which graciously allows researchers to use their library and equipment, but it could be photographed. Through the glass is not the best shot, but there it was, the defining information. 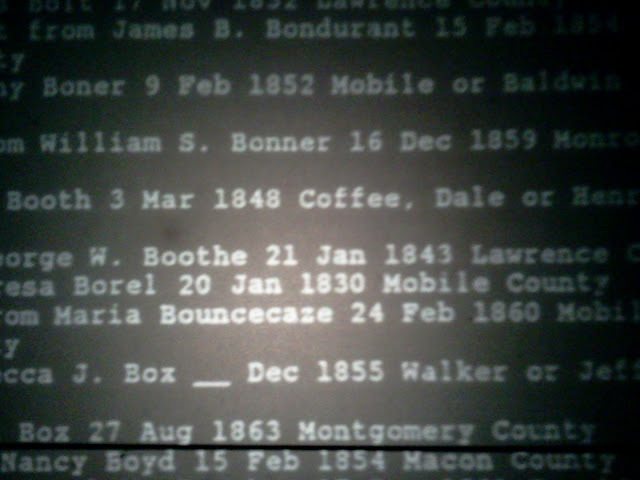 Under the lists of Alabama divorces of that era, a misspelled "Marian Boothe" from George Washington "Boothe" January 21, 1843 Lawrence County. Mariah recieved her divorce. Her freedom from tyranny would be short-lived however, as she would die in Limestone County, with the Malone family, before the decade was up. Several ladies of her standing and in her family filed for divorce during that era. I had seen many within the Booth/Jones/Malone family on the divorce list. These independent Scarletts had the resources and gumption to "not take no crap', even in the early years of America. 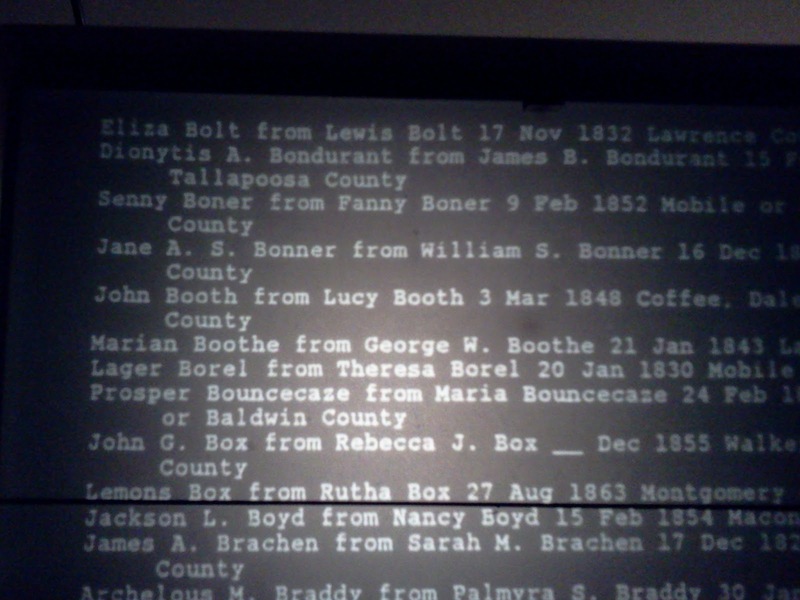 John Booth and Lucy are listed just above her. This was probably John who married Lucy Gilliam Malone. The story of Mariah does not end here. I will be returning to her shortly, and continuing with the saga of her daughter Mary Ann, and how their noted cousin, the great navigator and blockade runner, John Newland Maffet, Jr. sewed it all together.